Welcome to the second instalment of our Image Reboot – in partnership with Lucile’s Photo101 Rehab Clinic. You can find the first one here. As enthusiastic photography enthusiasts, we wanted to include some editing techniques here – I am just an amateur, having installed Lightroom about a year ago and have taught myself the basics of photo editing, really just using trial and error in the beginning to see what worked and what didn’t. Then I did a lot of reading and have managed to make some good edits as a result. These two photos were taken in a hotel room in Melbourne. I was trying to come up with a “Guessing Game” photo for Justine’s Eclectic Corner. This plant was on the windowsill, so I took a few photos with the macro lens. I didn’t end up using the photos for the “Guessing Game” and so the photos have stayed hidden in my files until now. I wouldn’t say these photos were “lost” but they didn’t seem all that inspiring until I started developing them in Lightroom. I wanted to whiten the background, so I increase the highlights (+30) and the whites (+85). This really opened up the image for me. To help increase the contrast of the colour from the white background, I decreased the shadows (-19) and the black level (-62). A final boost to the clarity (+42) finished it off for me. I started by cropping out the parts of the plant at the top of the image and also rotating the image just slightly. To whiten the image, I increased the whites (+88) and brought the exposure down a little (-0.4). This worked better to keep the detail in the little fibres on the plant. If I increased the exposure (as I did in the first image), then I overexposed those fibres and lost them. The sliders in Lightroom really help with immediate feedback on the image. Next, I decreased the highlights a little (-14) and, to bring out some detail, I increased shadows (+22). Finally, two things to heighten that contrast between black and white – I pulled down the black level (-47) and increased clarity (+84). I’ve learnt not to be afraid of taking some of the settings to the extreme – extreme white, extreme contrast, these can make for some really cool images. Please let me know what you think. As before, if you’d like to try your hand at editing these images, let me know and I can send you a copy, or you can just copy it yourself from this post. 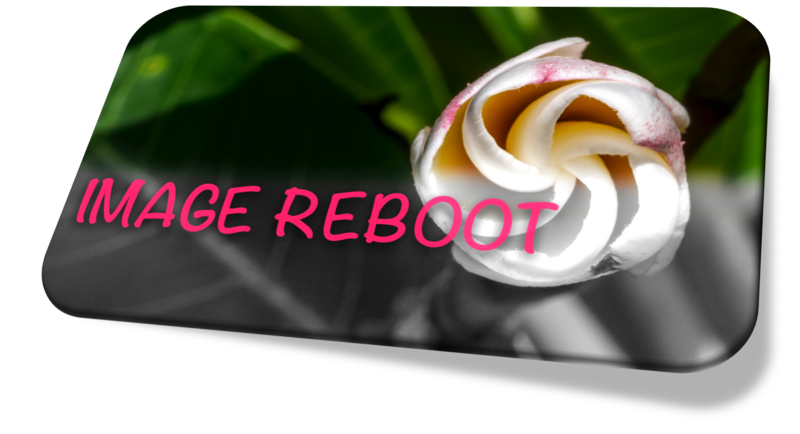 If you want to create a new post with your results, it would be great if you could link it back to Image Reboot and tag your post with #imagereboot. I’ve edited RAW images here in Lightroom, but you can use quite similar techniques in most software packages, you can also use standard JPG files. That’s what I love about LIghtroom! Often you can work with photos that are bland and tunr them into something better. I agree with you on the extreme part too. I know that a lot of photographers are always preaching moderation when it comes to sych things, but I choose to trust my own experience and my own taste. We are speaking the same language!! Love it. Thanks PP. It is time consuming but I get in the zone and really enjoy it. Yah I don’t think it matters what you use as long as it’s fun and not too complicated!! Yes! It took me a little while to figure out the other settings beside basic contrast and I still don’t get the color optimization. I figure there must be some way to even out white balance but no idea about that either. 😀 It doesn’t matter though. I know I’ll figure it out eventually. I could honestly spend all night playing with my photos and never tire. It’s nice to know others out there feel the same! You. Are. Not. Alone. LOL. Excellent and informative post and great images (to boot) !